Bespoke Beijing and Penguin Books are proud to announce the official walking tour of Midnight in Peking, Paul French’s bestselling murder mystery. This is your chance to retrace the footsteps of those embroiled in the grisly death of Pamela Werner (a British diplomat’s daughter) in 1930s Peking – a death that shocked the foreign community to its core. From the ominous ‘Fox Tower’ to the gritty ‘Badlands’ and the former foreign legation quarter, two historians who have carried out painstaking additional research into the Chinese side of the case will beat a path through the little known areas of old Peking, painting a vivid picture of a period in Beijing’s history it would rather forget. Most exciting of all, the newly uncovered Chinese police reports on the case detail several characters not mentioned in the book, offering critical new perspectives on the murder. For fans of the book, this is a tour not to be missed. 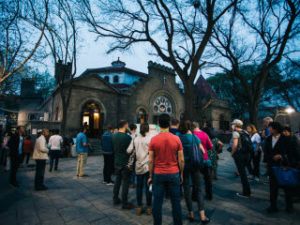 NOTE Bespoke’s public Midnight in Peking Walking Tours take place on the last Saturday of every month. The next one will be on Saturday, September 29th. To book tickets, click here!